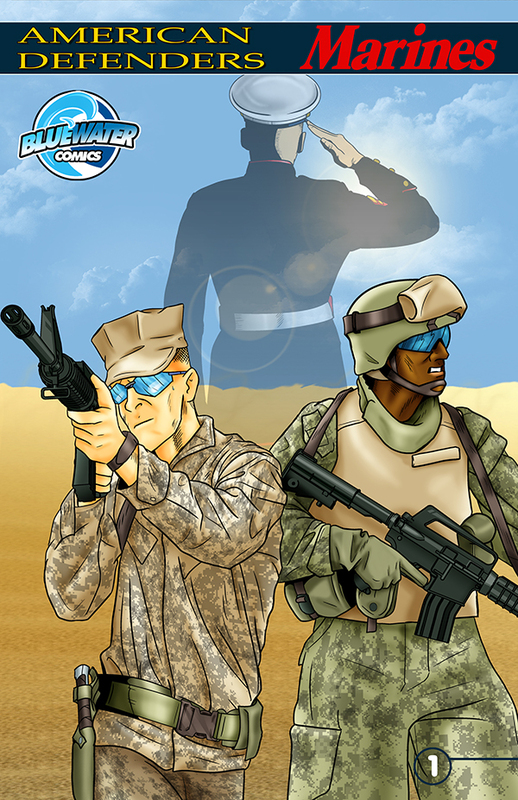 A new comic book, set for release Wednesday, will cover Marine heroism from Tripoli to Afghanistan. Titled “American Defenders: The Marines,” it is part of a series published by Bluewater Productions that highlights the history of each branch of the U.S. armed forces. In it, “we find out how the few, the proud and the brave not only fight for freedom, but continue to defend America in their greatest times in need whether it be in the Halls of Montezuma or on the shores of Tripoli…,” reads a company press release. The comic will be available in digital format from iTunes and other eBook retailers for Kindle, Nook and other platforms. The company has already released comics about the Army and the Navy, and has plans for another next year about the Air Force. This is not the first time heroic Marine exploits have been the inspiration for comic illustrations. A series ran in Marine Corps Times and Marines Magazine in 2010, inked by combat artist Staff Sgt. Kristopher Battles. Called Sharing the Courage, it highlighted individual instances of heroism. Sgt. Maj. Brad Kasal, for example, was the subject of the first installment. He received the Navy Cross for actions in Fallujah, Iraq, in 2004 where he served with Weapons Company, 3rd Battalion, 1st Marines. While clearing a building, Kasal was shot seven times. He was then sprayed with 40 pieces of shrapnel from a fragmentation grenade that exploded as he treated a wounded Marine. Despite his own wounds, Kasal refused immediate evacuation, instead shouting encouragement to his comrades while ensuring other casualties were evacuated first. The purpose of the series was to bring to life vivid details sometimes lost in the text of official medal citations, Battles said of the series in 2010.